I chose to stay at the Sundown Ranch Hotel for the last two nights during our stay in South Africa. Originally I had decided to book one of the cabins, but I was not satisfied by the standard of these cabins. 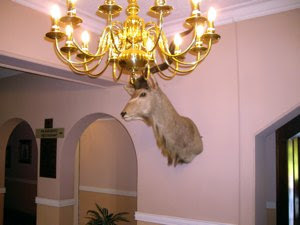 I was however very pleased by the hotel. 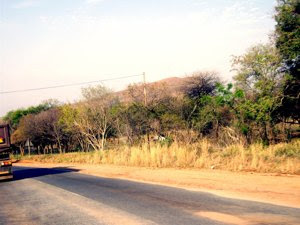 This hotel is seriously far into the bush, with no public transportation available. This means that you will need to hire a car to get there. 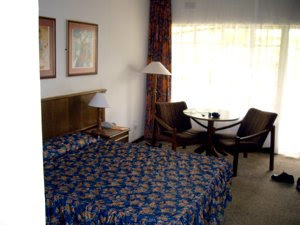 If you decide to stay at the nearby Sun City, you may travel there by airplane or you may get transportation from Johannesburg International Airport at special rates. 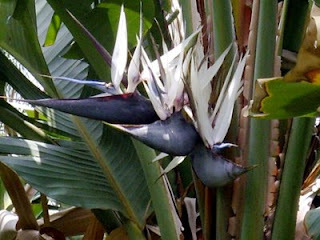 But be aware, staying at Sun City comes at a price. The Sundown Ranch Hotel had a very professional staff. Top notch for service. Nice and pleasant staff in the reception and in the breakfast room. The only exception was during the only lunch I enjoyed at the hotel, where I waited too long for a pasta dish that did meet my expectation. The floors in the rooms had wall to wall carpeting. It is extremely difficult to provide good air quality and good hygienic standard in rooms with this surface. In spite of this, the hotel held a very high hygienic standard. You found the same good standard throughout the rest of the hotel. There was only one disappointment. As the tempting swimming pool in the enclosed garden, dirt started to float around in the water. This should be a word of warning to any hotel with such facilities - badly maintained and cleaned pools may be a source of health problems for vulnerable groups as kids or the elderly. The Sundown Ranch Hotel provided good accommodation. It had spacious and light room, but the design felt a little outdated or old fashioned. The big plus of the room was the large terrace overlooking the beautiful enclosed garden. This was the place to sit and enjoy a cold glass of white wine during the afternoon heat. The tiled bathroom was a little small and outdated, but held an acceptable standard. Here I have recorded a film, so you may judge the rooms yourself, and by the way, opening the door to the terrace posed the same challenge every time. Thank God! The breakfast was included in the price, and they made proper coffee. I was very impressed by the breakfast. Here you could order freshly made omelet with cheese and ham, there were a good selection of meats, cheese, muesli, yogurts, and juice. 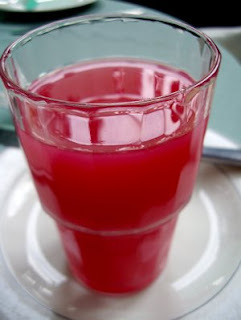 As this delicious colorful glass of fruit juice. 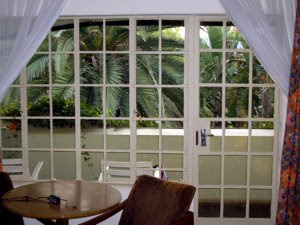 And you could sit down outside in the beautiful enclosed garden in enjoy your breakfast. I loved ever minute of it. 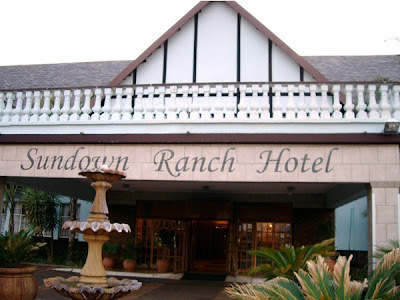 The Sundown Ranch Hotel offers a whole range of facilities. You have a bar and a restaurant. The bar was a little dark and I tended to go out to enjoy my drinks at another bar located by the swimming pool. The prices were ridiculously low, after our standard. I had one lunch at the restaurant. It did not cost very much, but was not a success. Pasta carbonara, that tasted neither bacon, nor eggs, or cheese. The garden was an enormous asset, and I will write a separate article showing the beautiful flowers here. The swimming pool was impressive, but the latter had not been properly cleaned. Paying a little under €50 per night, breakfast included, is a real bargain. Sundown Ranch offers recommendable accommodation at an unbeatable price.